Our meals consist of main meal and dessert, or main meal and soup (when available), or you can choose to have a main meal on its own. They are cooked in our purpose-built kitchen on a 6 week rotating menu to ensure you get plenty of variety. Alternatively you can purchase multiples of the same meal if you prefer. 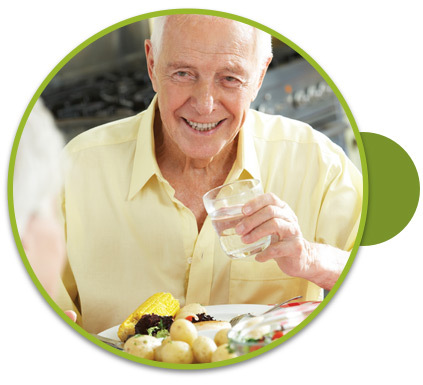 Meals can be delivered on both a short-term and ongoing basis as you require. We are able to cater for some individual requirements, such as texture modified meals or specific diet related meals, like vegetarian or diabetic friendly. We also accommodate medically diagnosed food allergies, other than nut allergies or intolerances. Should you have a large range of dietary requirements please contact our team to discuss your options and whether we can help. You can rest assured that the meals you purchase from us are of the highest quality and prepared under strict food safety standards. We are proud to have achieved and maintained accredited status in an internationally recognised food safety program (HACCP), which is independently audited annually. If you are a HACC referred customer, you will be able to purchase meals at a reduced price. Meals can also be purchased privately and will be charged at the standard price. Additionally, we deliver meals on behalf of other local governments, so you may be able to purchase our meals and have them home delivered if you reside in one of these areas. Please contact us if you have any queries about deliveries outside of City of Stirling.